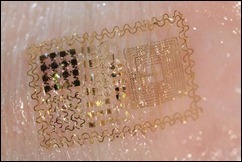 In the realm of medical devices, this is one of the coolest things I’ve seen in a long time. 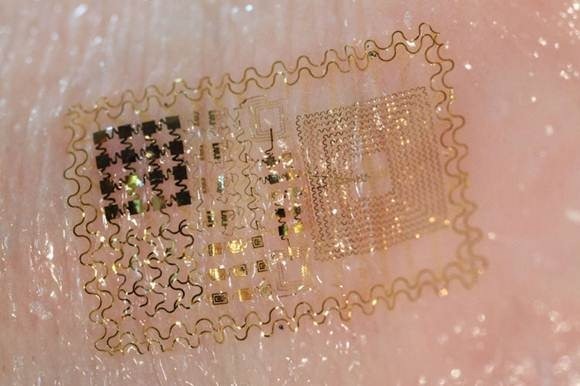 University of Illinois engineering professor John A. Rogers and team have designed a sensor that’s about as obtrusive as a temporary tattoo. Not only can it pick up biometric data, but when placed on the throat, it can sense differences in spoken words such as “stop” and “go,” as well as directional commands. Hot news for patients with muscular or neurological conditions, it appears in last week’s Science. Pardon me while I embrace my inner physics geek, but the sensor adheres using the van der Waals force, which is what geckos use to climb glass. Sounds funny, but it’s a big deal for patients who are allergic to medical adhesives. Tuck that away for your next Trivia Night. I came across too many juicy tidbits this week to hold them for EP Talk, so this week’s Curbside Consult is more newsy than usual. Some recent all-nighters and an insane volume of Meaningful-Use related work also may have caused my attention span to be so short I’m not sure I’m capable of crafting an entirely cohesive page-long feature at the moment. Now that some vendors have finally tweaked their systems to allow appropriate documentation, the World Health Organization declares the H1N1 “swine flu” pandemic over. It doesn’t mean that the virus has gone away, just that it no longer meets pandemic standards. As an IT person, this was a great litmus test for the ability of vendors to be nimble. Quite a few were able to load systems with the ability to document, treat, and track quickly; several were less fortunate. This isn’t the first time we’ve seen emerging diseases (remember SARS?) and certainly won’t be the last, but hopefully next time it will be easier for the end users. The Patient Right to Know Act will bring back a controversial Illinois database housing information on physicians, including malpractice settlements and judgment information. The database and its associated Web-based tool went offline following an Illinois Supreme Court decision regarding a medical malpractice reform law. The database will contain information on over 46,000 physicians and should be online in a few months. Speaking of state news, Kentucky and Ohio are banding together to share prescription data. KASPER, the Kentucky All Schedule Prescription Electronic Reporting system, will connect with the Ohio Automated Rx Reporting System, also known as OARRS. (Not to be confused with the band O.A.R., which if Mr. H hasn’t listened to them yet, he should check them out — their new album was released last week.) Focusing back on the topic, it sounds like a great idea, but I’m very interested in how it actually works for the doc who’s trying to figure out whether the patient is drug seeking. If anyone has details or first-hand knowledge, please share. Athens Regional Medical Center in Georgia has seen a 15% rise in online scheduling since implementing a scannable Quick Response code in advertising materials. The code is different depending on where it is placed, allowing tracking for the most effective referral sources. I just discovered this is the tail end (no pun intended) of the World Mermaid Convention, so I’m going to check that out. If it’s a bust, there’s the Official Star Trek convention as well. Viva Las Vegas!